‘The innovation journey’ – written by Andrew van de Ven and his team – is offering a vivid description of the innovation experience of 14 North American companies. The book offers snapshots of brilliant ideas, whimsical processes, failure and success. After having read the book you will understand why 50% of all investments in R&D had to be amortized. Against this background, it is not surprising that scientists and business people have been thinking for decades how to improve the efficacy of the innovation process. The most famous example is Cooper’s stage-gate model. The underlying assumption of this model is that the success of the development of new products and services depends from moving along consecutive stages with Go / No-go decisions in between. You will ask, “Does it work? The question that has to be answered is which kind of ‘guidance’ will facilitate innovation processes best? Most authors feel that the initial stage of the innovation process – named ‘fuzzy front end’ or ‘ideation’ – offers best chances for improvement. Last year, I did a research project in order to unveil whether careful planning of this stage will increase the success rate of innovation. I visited ten companies where I spoke with managers and leaders of innovation teams. Each of these companies deployed the FORTH innovation method (developed by Gijs van Wulfen) in the period 2007 – 2013. I wanted to discover critical success factors during the initial stage and the impact of the initiation stage at next stages as well. 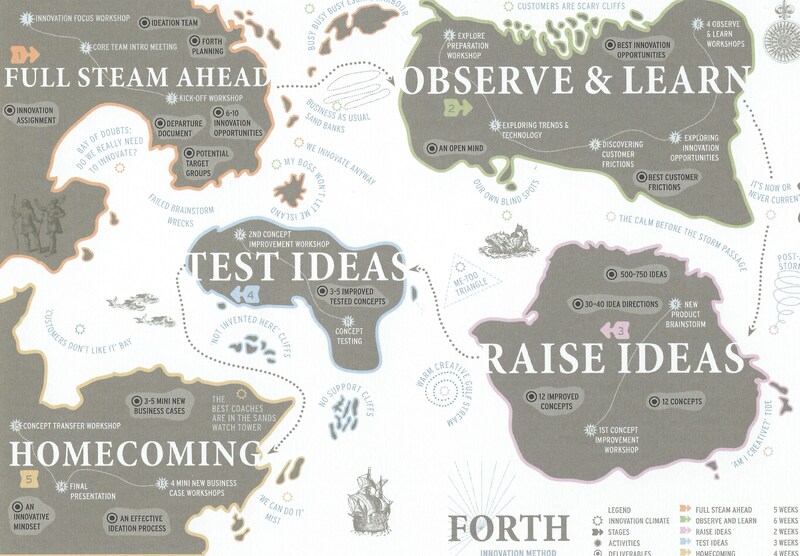 The FORTH innovation method is modelled like an expedition. The innovation team moves along five stages: Full Steam ahead, Observe and learn, Raise ideas, Test ideas and Homecoming. The first step – Full steam ahead – includes a precise definition of the assignment. Here the management takes the lead. A good assignment defines the direction of the expedition, and the conditions that have to be met. Besides, the team is selected based on criterions like diversity, innovation-mindedness and team spirit. Premature generation of ideas is a frequent mistake in this step, resulting in the failure to make an adequate selection. Therefore, during the second step – Observe and learn – participants visit customers or clients at home in order to discover preferences regarding new products or failures connected with existing products. For most participants this is the first contact ever with customers or clients and the experience is valued highly. In addition, the participants are enabled to deepen their knowledge of new technological developments, mostly related to ICT. By taking this step, participants are developing a feeling for customer frictions and innovation opportunities. With this baggage, participants are ready for the third step, raising ideas. New ideas are produced by hundreds and afterwards channelled into 12 concepts. These concepts are carefully scrutinized, taking into consideration the conditions that were formulated at the beginning. Now a next step – Reflection – can start. A second confrontation with customers or clients is organized in order to check the assumptions regarding the usefulness and market-potential of the concepts. In the end 3 – 5 concept survive, often after thorough revision. The last step – Homecoming – includes further elaboration of the concepts into mini new business cases, possibly with the help of internal or external experts. All companies that participated in the research expressed their enthusiasm about the FORTH innovation method. They were convinced that no ‘mini new business cases’ would have come into being without the systematic and motivating character of the method. Besides, participation at the FORTH innovation trajectory has created an innovative mind-set and a corresponding innovation culture. Employees are eagerly waiting for the next innovation expedition to start. Critical remarks have been made too. Some members of the innovation team went too fast through the process of discovering customer frictions and customer needs. In some cases the satisfaction with the results of the ideation stage resulted in a rash decision to enter the market without additional research. 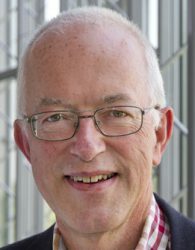 Gijs van Wulfen’s ‘Innovation expedition’ is based on thorough knowledge of potential failures that are described in Andrew van de Ven’s ‘Innovation journey’. Therefore, both books are sides of the same medal. 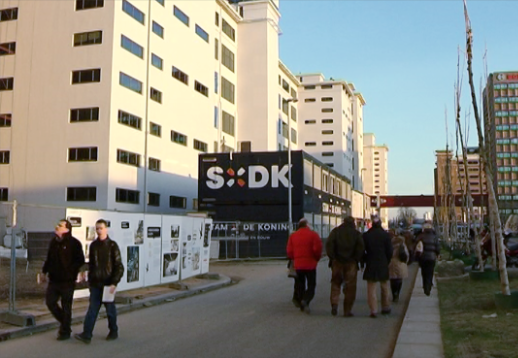 At Thursday January 15th 2015 4.00 PM Herman van den Bosch and Gijs van Wulfen will discuss the results of the research project mentioned-above. You are kindly invited to participate and to listen to the discussion and to ask questions (by chat) if you want. Go to: http://portal.ou.nl/en/web/masterclass-mw-150914 for signing in and to register. If you have arrived at the right page, press SIGN IN before registering and move along the prescribed steps. It will take you a couple of minutes. Van de Ven, A., Polley, D., Garud, R., Venkataraman, S (2008): The innovation journey, Oxford University Press, New York. During the past 10 years, ICT – bandwidth, memory, speed, and especially software – has improved tremendously. Connecting ICT-power with other devices has enabled 3D printing, Internet of things, wearables and robotics. 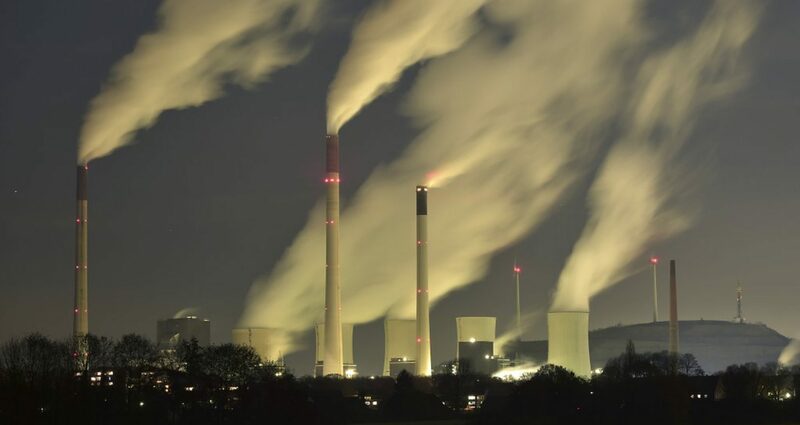 Its disruptive influence at industry is only in the first stage. However, even more important is that the underlying knowledge has become distributed and is no longer limited to small groups of scientists in universities and R&D centres. Worldwide, millions of young entrepreneurs prefers the live of an explorer and innovator in garages, empty industrial buildings, science parks or wherever over being employed in a large bureaucratic company. Until recently, a centre-periphery model sufficed to characterize the economic relations in the world. The centre (Europe and the USA) bought raw materials, and mass products in the periphery in exchange of high-end products, knowledge and (financial) services. Nowadays, a multitude of centre-periphery relations has come into being. The old centre has to compete with rapidly developing competing centres. The winner is going to be the owner of the most distinguishing innovation capabilities. Besides, the development of ever-changing new products requires a high degree of inter-firm cooperation. Here too, small and agile new market entrants seem equipped best. “Traditional” companies have to reinvent themselves In order to cope with the ‘Big Shift’. The first step is dividing itself in smaller flexible entities. Further, the process of reinvention has to put knowledge workers in the centre of operations at the expense of the until now dominant position of managers-class. The feasibility of a redesign depends from the degree of engagement and intrapreneurship of the work force. In this respect, recent studies are not encouraging. 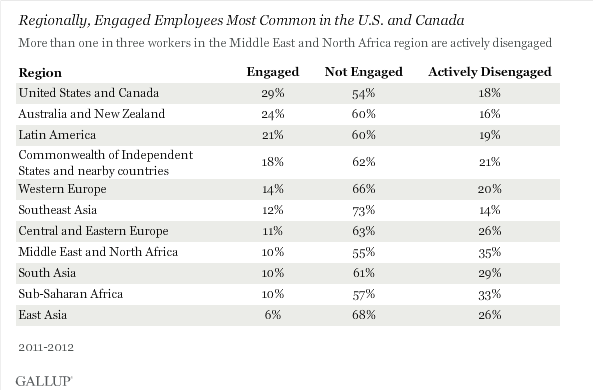 Each year Gallup is collecting data of the engagement of the global workforce. Employees are characterized as being ‘engaged’, ‘actively disengaged’ and ‘not engaged’. The table beneath gives an overview, showing that the USA, Australia and Canada have most reasons for optimism. The lack of engagement is caused by the “low strain” characteristics of the majority of jobs, the authoritarian behaviour of many bosses, the uncertainty of keeping one’s job and work pressure. I prefer the term intrapreneurship over ‘passionate explorer’, as deployed by Deloite. Intrapreneurship is based upon specialist business knowledge, the drive to explore new frontiers and a feeling of urgency to cooperate. The ‘Big Shift’ report reveals that only 12,5% of the workforce is ‘intrapreneurial’. Probably the lack of engagement is prohibiting quite a number of latent intrapreneurs to act. The lack of Intrapreneurship is quite understandable. The 20th century companies have organized their production according to well-chosen strategic principles empowered by detailed planning, control and quality systems. Consequently, skillful and accurate performers dominated the workplace. Competence management systems guaranteed the right employee at the right spot. Room for intrapreneurship was limited. It is this lack of intrapreneurial opportunities that has causes a true exodus of talent from companies in the USA and other countries. Each year, about 2 millions of employees have given up well-paid jobs. The estimated damage caused by the departure of high-potential employees is about $200 billion each year. The independent workforce in the US nowadays counts about 17 million people. The conclusion is obvious. Above all, the strongly-needed reinvention of companies depends from the retrieval of engagement and entrepreneurship al main characteristics of the work force. Engagement will increase as soon as the workforce feels more respected and recognized and if managers do better jobs as coaches. Structurally, workplaces have to become more demanding. Theresa Amabile has discovered that employees are motivated in the first place by ‘the progress principle’, the meaningfulness of their contribution . In order to comply, workplaces have to combine a sufficient degree of challenge with a corresponding degree of autonomy. Retrieval of intrapreneurship is more demanding. Needed are: decentralization of the governance of firms, servant leadership, reduction of management, smaller differences in compensation of managers, active promotion of (open) innovation, and deploying collaboration opportunities outside the firm. Anyway, most companies worldwide have a long way to go. The most innovative firm will be the firm that is succeeds in the improvement of engagement and intrapreneurship. http://goo.gl/oQEQzi. Research with respect to the passion of the workforce included 4000 employeed in different branches in the US. In that case, you might also be interested in my weekly posts in Dutch language: www.hmjvandenbosch.com My Dutch blog is named 'Betrokken wetenschap' (Engaged Scholarship). This blog covers the same topics as the English one. I will write me blogs either in Dutch or in English (except for the first one) Why two blogs? I try to think global and act local. I feel that I will create more local involvement by writing in Dutch (it is also much easier for me). However, I also want to stay in touch with my friends abroad. If I want to communicate with anybody, I will use the English version (in brief S4S).